The 'Pepperbox' or Tower of the Basilica of Our Lady of the Assuncion is property of the municipality of Zwolle. The 75 meter high tower has a carillon with 51 bells. The tower is to climb during opening hours of the basilica. 236 steps lead to the trans. From the trans around the lantern at 50 meters has a magnificent view over the city and surroundings. The Peperbus gives access to the church and bell tower of the Our Lady Basilica. Since 1999 the church bears the title 'basilica minor'. This title was granted by Pope John Paul II on October 18, 1999 to celebrate its 600 anniversary. See below for Basilica of Our Lady. The church is built in stages between 1394 and 1452, is used as a Catholic church and belongs to the parish Thomas a Kempis. The shrine of the famous writer and spiritual Zwolle Thomas a Kempis is preserved in the basilica. This shrine can be visited. On February 24 recently the shrine was resaeled after research is done. During the Reformation, the church is to worship extracted. In 1591, the last service was held. King Louis Napoleon in 1809 gave the church building, which now features all kinds of non-church had, to the Catholics. The church was refurbished in 1811 was the first mass again read. Also certain Louis Napoleon that the tower owned by the Municipality of Zwolle would remain. In 1930 the tower was enriched with a Taylor carillon. It is equipped with an automatic chimes chimes that every fifteen minutes a short tune. 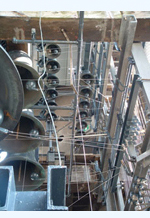 The carillonneur Roy Koezen plays the carillon weekly on Fridays from 11.00 to 12.00 and Saturdays from 13.30 to 14.30. In the years 2002 to 2005 the tower was completely restored. All anchors and rusty irons are replaced and the rotten wood and cracked stone. The shape and appearance of the tower had thereby remain intact. The carillon was expanded with 4 bells and a new keyboard installed. The carillon has 51 bells now.